Translated as "the science of living wisely and well," the holistic medical system of Ayurveda teaches us how to obtain harmony within ourselves while maintaining harmony with nature. 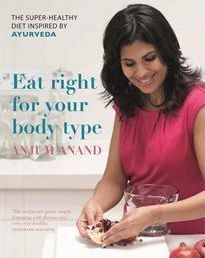 In this beautifully illustrated guide, celebrated chef Anjum Anand explains Ayurveda's three body types (doshas) and their connection to food and health. Readers can adapt each of the 75 flavorful recipes (which are inspired by both Eastern and Western cuisine) to suit their own dosha in order to get back in shape naturally and achieve better digestion, energy, and immunity.The book includes three Ayurvedic detox options, food charts, and healthy eating tips. Anjum's Eat Right for Your Body Type is a perfect fit for any woman in search of a delicious diet plan for weight loss and optimal health.